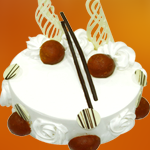 VALENTINES HAMPER 13A | Cake Shop Mumbai, Best Cake Shop Mumbai, Order Chocolate Cakes, Order Fruit Cakes, Cream Cakes in Mumbai, Deliver Cakes in Mumbai, Cakes for All, Cakes in Mumbai, Best Cake Shop in Mumbai, Cake Delivery all over Mumbai, Premium Cakes of Mumbai, India. All Products will be delivered only between 12 p.m. and 8 p.m. Product decoration and look may differ from the image displayed. Valentine's Day Specials by Hangout Cakes & More. Each Hamper has Moulded Heart Shape Cashew & Almond Chocolates & Rock Chocolates(300 Gms).